Description: Black swallow wort is a perennial vine with a single non-branching stem reaching lengths of 6 feet. Dark green leaves grow oppositely on the stem and are lance to heart shaped. Flowers have 5 petals and are purple to brown and fragrant. Fruits are slender green pods which turn dark brown when ripe. Back swallow-wort has dark purple blooms. Other swallow-worts have lighter-colored flowers. Pale swallow-wort, C. rossicum, is also invasive in the northeastern U.S.
Swallow-wort climbs up any vegetation, including itself. Seed pods are 2 to 3 inches long and brown when mature. Like other members of the milkweed family, black swallow-wort seeds are wind-dispersed. Habitat: Black swallow wort grows in disturbed open areas along roadsides, railroads, woodland edges, and in open woods in moist soils. 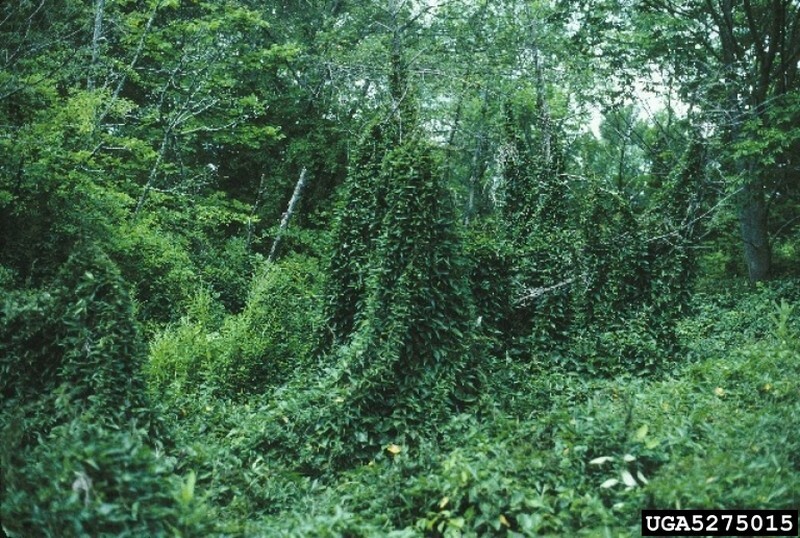 Invasive Traits: Black swallow wort grows vigorously along edges and open areas crowding out and shading native vegetation with its tangled thickets. Control: Hand pulling can be effective for isolated populations only when root systems are removed and remains are bagged and transported off site. Repeated mowing can be effective if done just as seed pods are forming. Herbicide application is effective when applied using foliar spray. Repeated treatments necessary for vigorous stands.